This is one of four tiny gift books designed to convey a special birthday greeting. Full of beautiful floral illustrations, they contain quotations from across the ages to celebrate a birthday, and space to sign the gift and add a personal note. 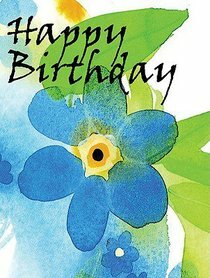 - Publisher One of four minibooks designed to convey a special birthday greeting, this volume includes floral illustrations. It contains quotations from across the ages, to celebrate a birthday, and space to sign the gift and add a personal note. One of four minibooks designed to convey a special birthday greeting, this volume includes floral illustrations. It contains quotations from across the ages, to celebrate a birthday, and space to sign the gift and add a personal note.